What is Aeronautics and Why You Should Study It? From the earliest times, humanity was inspired by the idea of flight. In their attempts, people created different constructions and machines to master the air space. As time passed by, engineers achieved incredible successes in their operations. Aeronautics is a discipline that gave birth to a great deal of technological advances that are integral parts of our daily life today. For instance, non-stick pans and handheld calculators were initially created for space flights! If you are willing to become a part of an aerospace community and create amazing innovative technologies, then you should consider getting a degree in aeronautics. It is a practical part of aeronautics. The art of aviation implies design, development, production, operation and use of aircraft. This branch of aeronautics studies the practical theory of aviation. This study considers operations, navigation, air safety and human factors. Engineers are responsible for design and construction of the aircraft. This science also works on the questions of aircraft’s power, use and controlling for safe operation. A great part of aeronautical engineering covers the science of aerodynamics that studies all aspects of the process of passing through the air. This title speaks for itself. Rocketry develops air vehicles that work from a rocket engine. What are the special features of studying aeronautics? 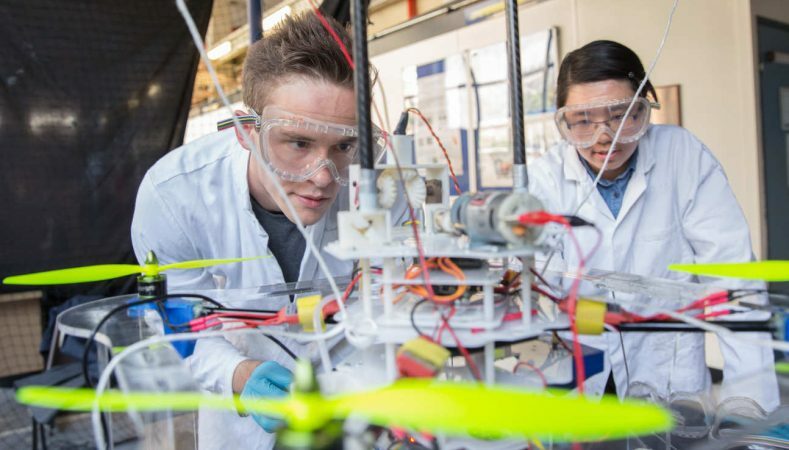 First and foremost, aerospace engineering is connected with group projects. Moreover, research and practice within the field are often international. It means that you should pay attention not only to the academic part of your studying, but also to teamwork and professional communication. In general, a degree in aeronautics leads to a variety of careers, both in flying and on the ground. For example, most universities that offer aeronautics faculty, train both pilots and aircraft engineers of all kinds. Pilots are usually preparing to transporting passengers, however some of them work in contiguous fields such as aircraft testing, crop-dusting, search-and-rescue and even firefighting. In turn, aircraft engineers are designing new details and efficient fuels for spacecraft and aircraft and this department is in a constant development. So the field of aeronautics is connected with studying different types of air vehicles and all aspects of their operating and functioning. The constantly developing science has close connections with astronautics that covers theoretical and practical aspects of navigation beyond Earth's atmosphere. There is a special term called “aerospace” that is used to describe both sciences at once. As a future student, you should be ready for a large flow of knowledge. You will face a lot of complicated and interesting things, so be responsible and hardworking if you really want to master the art of aeronautics. It okay if these difficulties will become too overwhelming sometimes, because there is a lot of professional essay services on the web and they are always ready to give you all the necessary aid. The Hottest Jobs in 2020- What Career Path to Chose?